In an interview at his Beijing headquarters earlier this month before the Picasso purchase was reported, Wang told me about his interest in two Chinese artists. The first, Wu Guangzhong, is widely recognized as one of China’s influential modern painters. Wang approvingly described Wu’s blend of Chinese and Western styles. “I bought many of his paintings,” Wang said, based on his early appreciation of the artist who died in 2010. Today, Wu’s works can be worth millions of dollars. 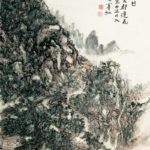 The work that hangs over Wang’s own office desk, however, is by Shi Qi, a Chinese painter who exhibited his work at the Louvre last year. Shi’s creativity is “even more advanced” than Wu’s, Wang said. “The Louvre isn’t a place where you say you have money and you can exhibit,” noted Wang, who said he owns about 100 of Shi’s paintings. Did the Absinthe Drinker Go to China?